Produce bins and tables are heaving under the weight of melons. 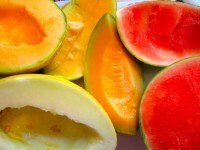 I’m making today’s recipe with locally grown melons and injecting the salad with a trans-continental flavor. My Thai basil needs trimming and the minty flavor is wonderful with melon. Thai basil is easy to grow and I always freeze freshly harvested, chopped or whole leaves to use through the winter in favorite Thai recipes. The flavor of this herb is obviously wonderful in so many Thai recipes; but I often use it as a substitute for, or in addition to, fresh mint in other recipes. If you can’t find Thai basil, fresh mint and cilantro are fine alternatives. Here’s another recipe I made last August – Melon Salad with Mint and Proscuitto – which is also appreciated when the local melons come to town! To make the dressing, whisk together lime zest and juice, walnut oil, honey, shallot and ginger. 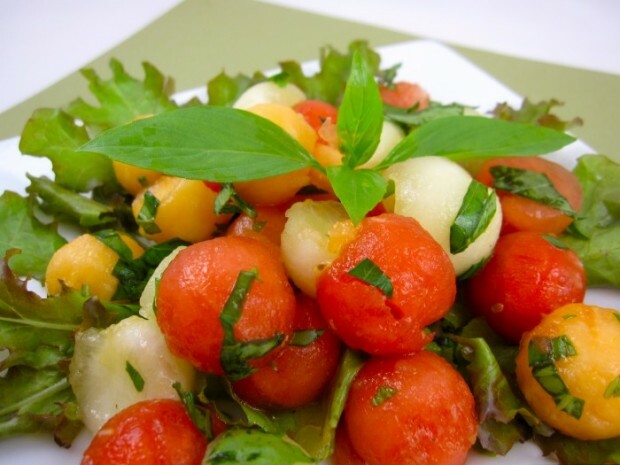 Toss melon and herbs with fruit. If time allows, let sit, refrigerated, 1-2 hours for flavors to combine. * May also use a melon baller to carve out fruit.